World Fastpitch Connection held their annual National Swing for a Cure softball tournaments in Florence and Summerville SC in October of 2015. This year, we were battling weather and floods but were still able to host these two tournaments. 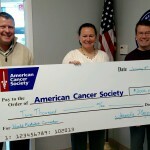 Monies raised from team entry fees, t-shirt and merchandise sales, gate fees, etc were donated on January 5, 2016 to the American Cancer Society. This year, WFC was able to donate $2,000. The teams were decked out in their pink everywhere and tournament t-shirts sold out!!! WFC is truly grateful for the continued support to raise money for such a great cause and hope that next year’s numbers continue to exceed our expectations. We will be hosting a big event in Myrtle Beach on October 22, 2016 so make sure you check out the details! !